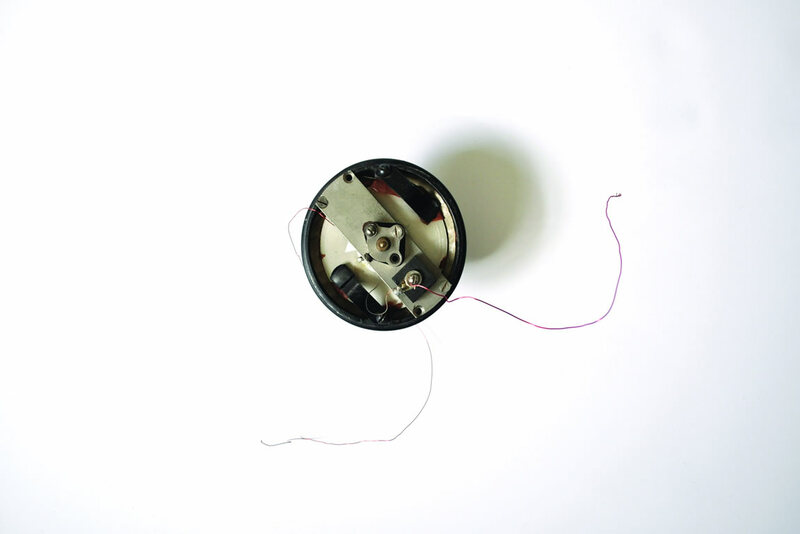 During and after our “Jacob: Recording on Wire” exhibit at the Audain Gallery in June, several people asked us how we remade Valdemar Poulsen’s early magnetic recording device (1898), which impressed sound onto piano wire. Here, then, is a brief description of our process, with details about what we tried prior to prototyping the device and installing it in the Audain Gallery a few weeks ago. (These details are not intended as instructions. They merely document our research process.) The lab refers to this process of sourcing, disassembly, remaking, testing, installation, and inquiry as “demanufacturing,” which—borrowing from fields such as materials science—we describe as the reintegration of otherwise “dead” technologies into scenarios for interpretation and experimentation. For us, these scenarios are developed across the arts and humanities, with questions of creativity, contingency, and culture in mind. To imitate Poulsen’s early experiments, we constructed a trolley and modelled the exteriors of a telephone receiver and transmitter. 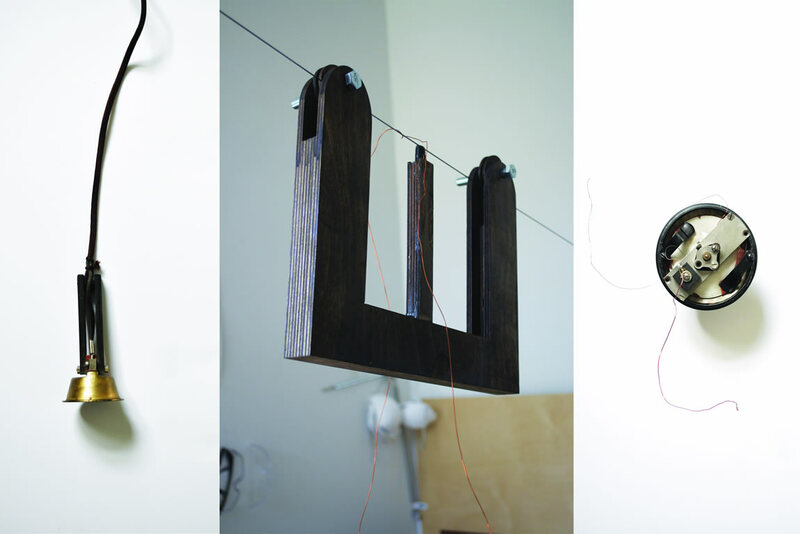 Next, we remade and tested various telephone parts to mimic Poulsen’s use of both a transmitter for magnetizing piano wire and a receiver for playback. Poulsen relied on existing telephone parts in his experiments. As such, we sourced receivers and transmitters available to him at the time (e.g., we ordered a few different Kellogg telephone parts from 1901). To test the transmitter, we created a circuit using the transmitter, an electromagnet, and a battery, as described in Marvin Camras’s 1988 account of Poulsen’s experiment. Unfortunately, during our first few attempts, the transmitter would not magnetize the wire. To gain a better understanding of the transmitter and receiver, we experimented with building them from scratch. We turned to resources that were written for hobbyists and tinkerers, including Old-Time Telephones: Technology, Restoration, and Repair, by Ralph O. Meyer, and Bob’s Old Phones, an online resource compiled by antique phone enthusiast, Bob Estreich. We began by building a simple pencil carbon transmitter, similar to several of the earliest transmitter designs. This version would transmit sound into a set of headphones or a speaker, but it was not nearly strong enough to magnetize the piano wire. Next, we tried a basic carbon granule transmitter, following Henry Hunnings’s 1878 design (Meyer, 16). Early transmitter patents relied on only one point of contact between electrodes, thus limiting capacity. In contrast, Hunnings’s use of carbon granules between the two electrodes ensured multiple points of contact and increased capacity. Hunnings’s transmitter still wasn’t reliable, since the carbon dust particles tended to pack together with use. In 1886, Edison improved Hunnings’s design by replacing the carbon dust with carbonized hard coal, since it was less prone to packing (Meyer, 17). We attempted making our own simple carbon granule transmitter, which was also far from effective. 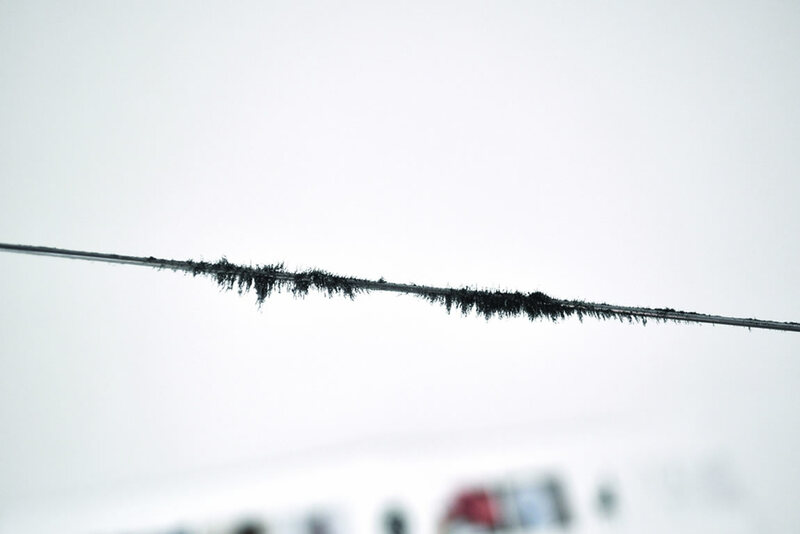 Much like our pencil carbon transmitter, it was simply not strong enough to impress sound onto piano wire. 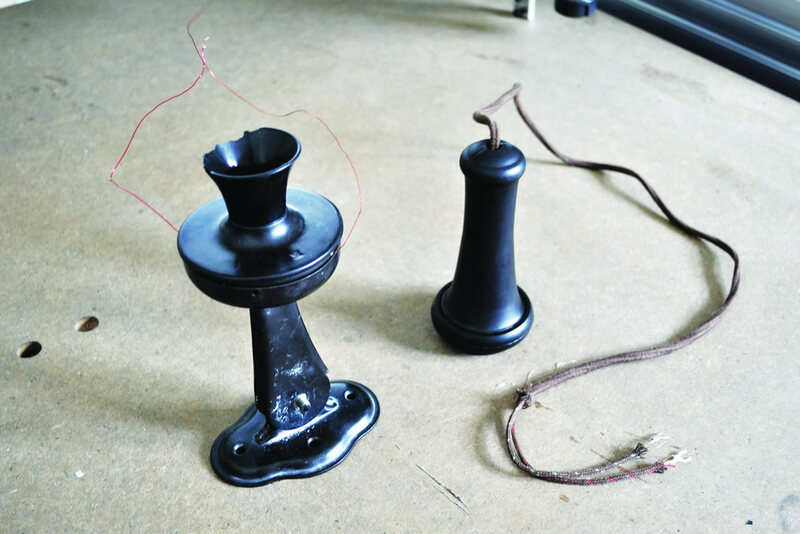 In 1890, Bell engineer Anthony White introduced the solid-back transmitter. This design became the transmitter of choice for manufacturers until the 1930s (Meyer, 18). More than likely, this transmitter would have been the kind Poulsen used for his magnetic recording experiment. It was much more difficult for us to replicate, since it was more complex and many of the parts are now very difficult to source. However, having gained a basic understanding of the transmitter’s design, we decided to restore the solid-back transmitter we already had at our disposal: we replaced all the copper wiring, cleaned out the dust inhibiting capacity, replaced screws to tighten the grips on the diaphragm, and repaired the plastic cover, which keeps the carbon granules in place. With this approach, we were able to magnetize sections of the wire by shouting into the transmitter as we ran the electromagnet along the wire. We were also able to test for imprinted magnetic fields by dabbing iron fillings along the wire to see where they would cling. Once we knew that the wire had been magnetized, we attempted to play back the sound by running the electromagnet along the wire again, this time connected to the telephone receiver. We occasionally heard small clicks when we ran the electromagnet over heavily magnetized sections, but the sound was hardly high fidelity. In the Magnetic Recording Handbook, Camras states, “if only the telegraphone had given loud, clear, reliable sound, it would have met with public acceptance. But the reproduction was weak and spotty” (6). Presumably, Poulsen’s initial experiment with playback would have been even weaker and less reliable than playback on a telegraphone (a device he exhibited in 1900). Even so, we are pleased with our success in magnetizing the wire and prototyping the recording trolley. What’s more, we recognize the impossibility of remaining true to Poulsen’s first experiments, and the contingencies of the recording process made us even more aware of differences over time. We weren’t there, but we better understand there now. Post by Katherine Goertz, Danielle Morgan, and Jentery Sayers, attached to the KitsForCulture and Makerspace projects, with the fabrication tag. Images for this post care of Danielle Morgan. Research based on “Making the Perfect Record” (published in American Literature).